It’s the drumbeat that pulls you in… These women are in demand around the world, as much for their prodigious choreographies as for their fiery djembe rhythms. Their unique concept and their energy drive the crowds wild! NIMBAYA! is a daring response to taboos stretching back thousands of years. Never before had women played the djembe in West Africa, the instrument being historically reserved for male players. In 1998, while managing the world-renowned ensemble “Les Percussions de Guinée”, Mamoudou Conde realized the world was ripe for change and decided to create an all-women percussion and dance ensemble. Chosen from among those living in the most difficult conditions - jobless and often with children to support - the women artists participate in the development of a lucrative art-form, one that has facilitated a change in their economic independence. Each artist strives to break free of the financially precarious lifestyle imposed upon her by society. In choosing to become a percussion player, these women have demonstrated their desire to control their destiny. South Pacific’s Ile de la Réunion welcomed the women’s first public appearance in 2002 when they played with Les Percussions de Guinée. 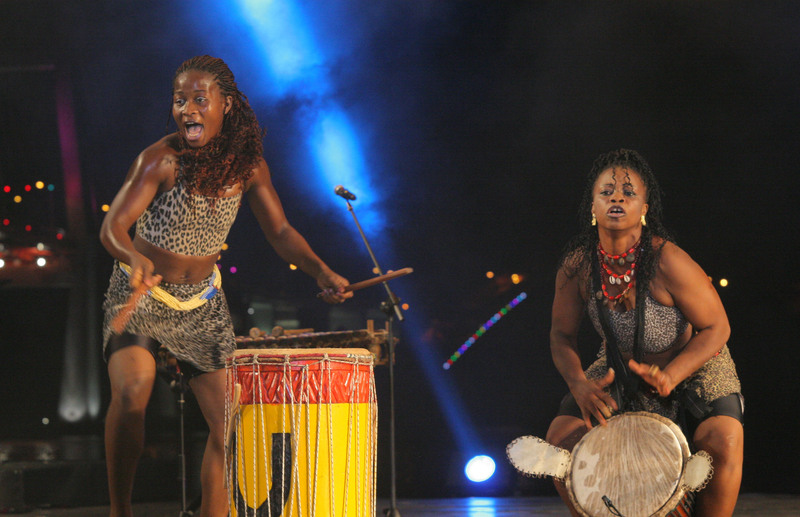 The crowd cheered as the women proudly took the stage besides the best of the best in African drumming. North American audiences witnessed a musical revolution in 2004, when the group toured US cities from coast to coast. From the very first show they received absolute enthusiasm. The stage was set to change the future of the djembe by presenting these women master drummers to the world. The ensemble embarked upon a world tour with a new program in 2006-07. The summer of 2006 brought the group to Ontario, Canada, with their first performance in London, before heading to Québec for a province-wide tour. Based in beautiful Ile d ’Orleans, they refined their performance before their first Quebec appearance at Montreal’s Festival International Nuits d’Afrique. The group’s huge success that night brought them again to Nuits d’Afrique’s main stage for an outdoor concert in front of a crowd of over 7000 people, closing the 20th Anniversary edition of the festival. Chicoutimi, Gaspé, Ottawa, St-Césaire, Fleurimont, Québec… over 4000 km traveled, tens of thousands conquered, an amazing media response; the Quebec tour proved to be a memorable success. The women drummers then travelled south. Based in Columbia (South Carolina) in the fall and winter, the artists gave drum and dance residencies to over 50.000 children from Georgia to Virginia, sharing their beautiful culture and rhythms with kids, teachers and parents. In October, the group was invited to be part of the first edition of the ACP Festival, bringing together countries from Africa, the Pacific and the Caribbean, in Santo Domingo, Dominican Republic. After their performance, the group gave a speech at the conservatory of music of Santo Domingo. Early in 2007, the group was invited to the Publick Playhouse for the Performing Arts in Cheverly, Maryland, just outside of Washington DC. A huge crowd welcomed the African women, who quickly forgot the cold of that February weekend: three performances and workshops created a lot of media attention! A few weeks later, the group traveled to Waltham (Mass.) for a week of workshops, panel discussions and performances, sponsored by the Women's Studies Research Center of the Department of Anthropology at Brandeis University. The closing concert ended up in a big village party, everyone leaving their seat to dance on the aisles! From then on, whether at Suffolk University in Boston, in Dallas (Texas), Arlington (Virginia), Detroit (Michigan), Philadelphia (Pennsylvania) or Chicago (Illinois), the same powerful magic occurred with audiences of all ages. The warm sun of Louisiana welcomes the group in April 2007. After performing at the International Festival in Lafayette, the group travels to Texas to perform at the Houston International Festival. Back in Louisiana for 4 performances at the New Orleans Jazz Festival, the group realizes that the site is simply huge! Professional and courteous staff helps us find our stage, set the drums and do a… 10-min line check! There, in front of the artists, over 70,000 people, waiting to find out who are those African women drummers. On that day, medias take note: “hyperactive rhythms” (USA Today), “the best set I hear all day” (New Orleans Nation Blog), a dynamic group women drummer from Guinea (The Rolling Stone Magazine). Another surprise awaits the group on their return to Lafayette for their closing performance: an invitation to perform with Salif Keita, the golden voice of Africa! That performance will remain a very special moment engraved in our memories. After more successful performances in the Midwest, the group prepares for their first European tour and the women are very excited! Our first European performance takes place at the Festival Couleur Café in Brussels (Belgium), where the national television shoots a special feature on the group. From our base in Brussels, the group then travels to Hertme (Holland), Aachen (Germany), Bordeaux (France), Gandia and Cartagena (Spain) and San Marino, before returning to Brussels for a final performance and workshops for the Belgium National Holiday. Everywhere our drums beat, the public and the media’s response is overwhelming. Back in North America, the group concentrates on the western part of the continent, traveling back to Canada for performances at festivals in British Columbia and Alberta. The road trip to Calgary (AB), Victoria and Salmon Arms (BC) is an amazing voyage for the artists, surrounded by the snow-topped Rocky Mountains and greeted by the warm audiences everywhere. After showcases in Los Angeles (California) and Las Vegas (Nevada), the group travels again to Europe, this time in Warsaw (Poland), for a week of workshops, residencies and cultural exchanges at the Academy of music, and performances at the Festiwalu Skryzowanie Kultur. Upon returning to the USA, Chicago, and the Canadian cities of Toronto, Winnipeg and again Montréal greet the group with enthusiasm. After one last performance in Nashville (Tennessee), it is with a lot of pride and sadness that the group returns to Guinea in November 2007: a time to take a break and spend time with the family, with the promise to come back soon. In January of 2008, the Dubai Shopping Festival invites the group for a series of performances as part of a show called “The Journey”, along with other artists: The Zulus from Durban (South Africa), Aborigines from Australia, and singers and dancers from the Cook Islands and New Zealand. During 3 weeks, the women offer daily performances in front of thousands, spending their free time shopping or visiting the city. NIMBAYA! also offered a free performance for hundreds of special needs children at their school. The 3-week program ends with a barbeque and a bonfire in the middle of the desert, laughing, dancing and sharing memories and experiences with the other artists. May brings the group to some of the best Children Festivals in North America: Seattle International Children Festival in Seattle (Washington), and after a break in Nelson (BC), the Edmonton International Children Festival (Alberta). In August of 2008, the group travels half the world to Seoul, South Korea, for performances at the Sacheon International Percussion Festival and Pyontek Super Percussion, and exchanges with other groups from India, the USA, Taiwan, Italy, Croatia, Korea and Japan. In September, the group travels to Brazil, a country with a drumming culture very much alive. NIMBAYA! performs besides artists such as Broadway’s “STOMP” for the Perc-Pan Festival, both in Rio de Janeiro and Salvador de Bahia. The artists also experience a memorable live TV appearance in Sao Paulo, with an invitation to perform at the “Programma do Jo”, the equivalent of David Letterman’s show in Brazil (watched by over 50 million people). From then on, everyone recognizes the group on the streets, at the airport, at the market place, the artists are overwhelmed! “Um ritual bellissimo.” (O Globo, Salvador, Brazil). November brings the group to Geneva (Switzerland) to perform at the Festival Tambour Battant, featuring some of the best in African music, cinema and visual arts, with artists such as Zal Idrissa Sissokho, Dobet Gnahore and film director Dany Kouyaté. The weather is very cold, but the group brings heat to the city with their energetic rhythms and dances, and receives great media review: “Un orchestre qui danse, tabasse et s’amuse de la pulsation première ….” (Tribune de Genève, Switzerland). After traveling more than 150,000 km by road and 90,000 km by plane, NIMBAYA!’s artists have spent the last 2 years preparing a new program for an international tour that is a commentary on the plight of African women, in an effort to redefine their role in the society. The artists will visit Europe, North America, Africa and Asia. Over 50 women are now rehearsing every day, learning new techniques and rhythms and adding more to their fiery dances and repertoire. In December 2010, Founding Director Mamoudou Conde traveled to Conakry (Guinea) for 6 weeks, recording a CD of the group in collaboration with French-Chilean group Sueno en la Fabrica, and preparing for the shooting of a documentary film about the women of NIMBAYA! and their wish to eradicate FGM. The group is now ready for their 2012-2014 tour in Europe and North America. 2011 also marks a new adventure: the artists of NIMBAYA! Women Drum & Dance Company of Guinea wants to speak about FGM and ask the world for their help to eradicate this cruel practice.